This solid 24” fencing helps to safely keep unwanted intruders out of the pool and keep toys and water games in. The rigid vinyl construction is maintenance-free, U.V.-protected, and can be mounted on any above-ground pool. Our mounting brackets are super-strong with rounded edges that easily attach to your pool’s uprights. Installation is easy and our fencing can fit any pool. All pools required Base Kit A. See sizing chart below. Backed by a 5-Year Warranty. To estimate which kits you will need to enclose your pool you will need to count the “fence sections.” One fence section equals the amount of fencing used to span between two pool uprights. Simply count the number of fence sections your pool requires and use our Fence Chart to determine which kits to order. All fencing, fence posts, installation instructions, and required hardware is included. All kits require the Base Kit. 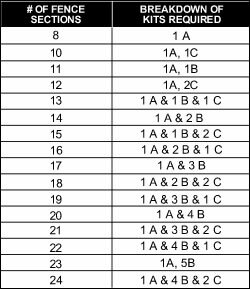 Then you need to purchase the required number of "Add-On" "B" & "C" kits.